Made with organic ingredients completely free of GMO's, preservatives, colors, additives, or artificial sweeteners, Rigoni di Asiago's Nocciolata combines hazelnuts, cocoa and cocoa butter, natural vanilla extract, whole milk and raw cane sugar for a chocolate-hazelnut spread with undeniably superior flavor. Nocciolata is made with environmentally-responsible cold-pressed sunflower oil. It also contains far less sugar than other brands and is free from hydrogenated fats. The product is also available in a vegan version, Nocciolata Dairy Free! 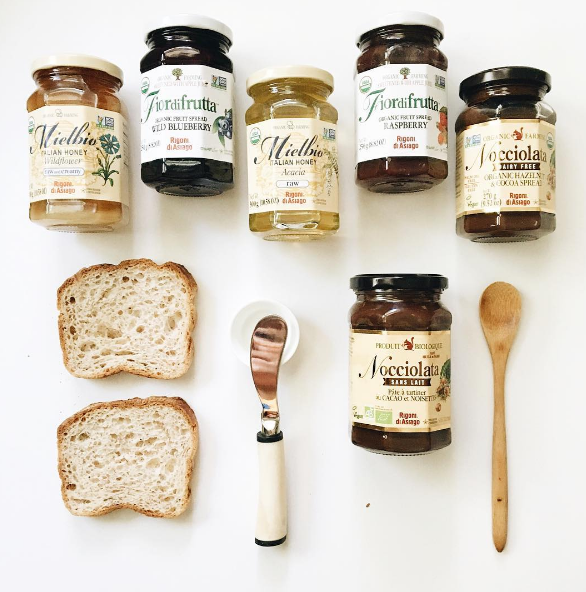 Prepared with perfectly ripened organic fruit, Fiordifrutta is a unique, light jam (no citric acid, no additives). It simply contains fruit sweetened with organic apple juice, providing a completely natural, healthy, low-calorie spread. Mielbio encompasses a full range of Italian honey from Wildflower to Acacia, Orange Blossom, Lime, Pine and many others. The new creamier texture is smooth and easy to spread with an even richer flavor: a unique development from Rigoni di Asiago expertise, honey beyond comparison. Dolcedi can be used any way you would use traditional table sugar or honey. Its neutral flavor enhances the taste of food and drinks without altering them. Dolcedi is also highly soluble in both cold and hot drinks and can be enjoyed with pancakes, on yogurt, in fruit salad, and in baking. 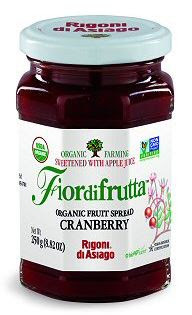 We've been thoroughly enjoying Fiordifrutta Organic Fruit Spread Cranberry - it's delicious on toast, waffles, and smeared on proteins like ham, chicken, and turkey!